Georg, the son of Hermann and Frieda Schmidt was born on January 2, 1925 in Schreibendorf, near Brieg in Silesia. His sister Hanna saw this world on December, 12 1926. 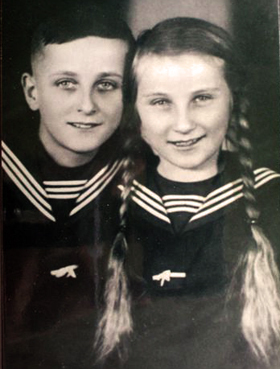 Their childhood was happy until about 1935. They had lots of fun growing up and helping in the market-garden. Yet, the carefree life of the children found an abrupt end. It wasn’t long after the National Socialist regime was in power that the children were being taunted, Bibelforscher Bibelforscher. After the father was incarcerated into the prison in Öls the children were assaulted “Your father is a convict.” The teachers in this school of about 100 children were all members of the party, so additional pressure was put upon the children. The German salute soon became mandatory. Those who refused to oblige and say Heil Hitler became a public enemy. The teacher set the children under constant pressure by means of humiliations and beating. During a short break of his father’s incarceration in 1938, the 13-year old son had his wish fulfilled and was baptized. It wasn’t long after his baptism on April 4, 1938, that a car stopped in front of their property. Two men of the Gestapo got out of the car with a court-order in hand. The parental rights were to be taken from them, and the children would be sent into foster care. The separation was heartbreaking. The mother was forced to hurriedly pack a few pieces of clothing in a small suitcase, and then the children were literally pulled from her side. The journey had an unknown destination. The train took them to Breslau in Silesia, the place were they would be separated. Hanna was being given to a family that owned a grocery wholesale outfit in Obsendorf in the administrative district Neumarkt in Silesia. Eleven-year old Hanna worked there daily from early morning till late at night. Schooling was on the bottom of the priority list. Any contact with the rest of the family was broken off. Letters were not delivered. Georg ended up with a farmer in Eichensee, district Militch, in Silesia as well. In early morning before walking the 45 minutes to school he fed 40 pigs on the farm and repeated this chore after walking home from school. His appointed custodian was his teacher. He was regularly subjected to brutal beatings, constant shenanigans and humiliations in school and on the farm. Any contact with their family was strictly prohibited. The siblings were housed about 100 kilometers apart from each other. They had scant information about the whereabouts of their mother. Only once they received a letter from her in prison containing three lines. There was no mail coming out of the concentration camp. After Georg graduated from school, he wanted to start an apprenticeship in horticulture. Yet the youth welfare office informed him that with an attitude like his, this can not be considered. He could become simply a gardener. During the time of his apprenticeship as a gardener he had to appear monthly at the youth welfare office to have his rebellious attitude examined. Both children never wavered in their resistance against the regime. The desire to live a life of a faithful Christian was anchored deep in their hearts.